The four seasons are distinctly felt in Sa Pa when Nature changes her costume. Spring in the season of pear, peach and plum flowers. Summer comes blooming with Gladioli, Pancies, Dahlias, Sun-flowers and numerous temperate fruits. Autumn is the time for perfume mushrooms, woodears and plenty of specious medicinal plants such as Black Ginseng, Amomum, Cinnamon, Anise etc. 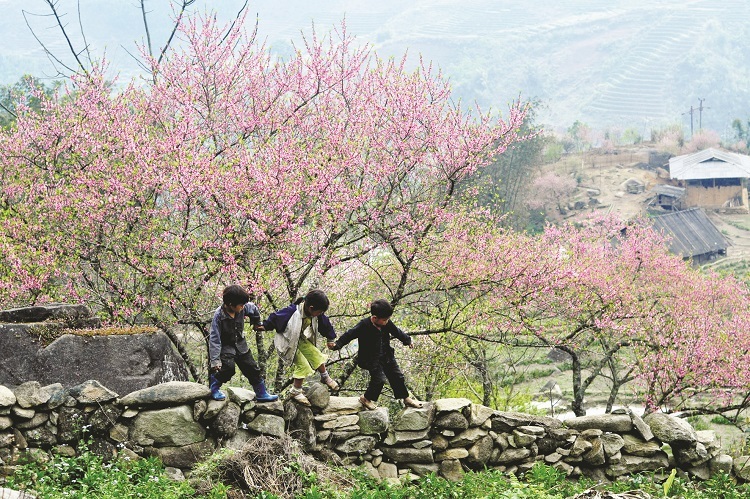 From February to April, Sapa is under true spring when the weather is favorable and ideal for visitors to take a trip to Sapa. The average temperature is about 15-180C with the high humidity. Trekking or adventuring under cloudy and foggy weather in misty mountains quickly spurs romantic imaginations redolent of fairy tales. Or sometimes, you feel like to be lost in the wonderland when see colorful valleys which are covered by a variety of flowers. It would not be an exaggeration to claim that Sapa is the kingdom of flowers, especially in spring because you can enjoy the best scenery of wild flowers everywhere in Sapa such as pinky and light red color of peach flowers, or pure white of plum blossom, or a valley of pear flowers, and so on. 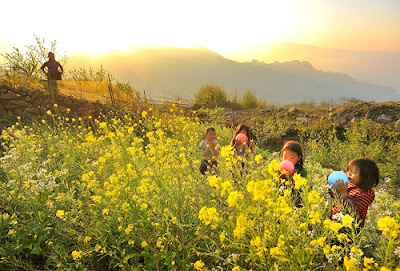 The ideal place for you to take flowers photos is O Quy Ho Pass which is the important connecting point between Lao Cai and Sapa. Plus, you also can visit Ta Phin to see the beauty of yellow cauliflowers. Summer in Sapa comes from May to September. 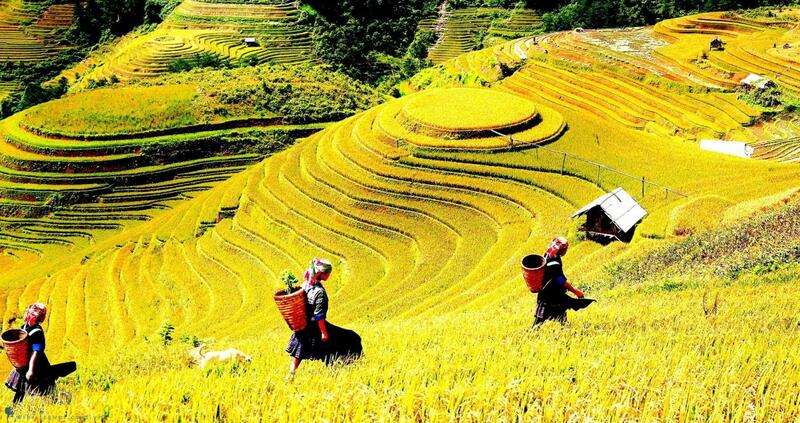 It is considered as the best time for travelers to have an excursion in Sapa. Although, spring is symbolized by a number of festivals and flowers, it discourages people by wet and foggy weather. However, in the summer, visitors will gain an occasion to enjoy the most favorable and nicest weather in the year. The average temperature is about 15-20 0C .Nevertheless, in some last months of summer, the weather may become wetter, especially in July and in August with the rainfall being too high at this time. Also, it is warmer and cleaner in comparison with three months of spring. Thus, it is extremely ideal for trekking or hiking. Your adventure is nothing as great as being taken under slight sunshine, light wind and fresh atmosphere. It is not only spring which has flowers, but also summer does. The forests in Sapa are more outstanding with romantic pensées flowers. In addition, this is the season of sweet fruits including cherry, pear, plum, peach fruits. In autumn, heavy rains really passes to make room for white cloud, blue and clear sky. The sunshine properly pours whole day in months of autumn with moderate level of rainfall, but highest humidity. Autumn in Sapa doesn’t attract tourists with interesting festivals like spring, or with sweet fruits like summer, but it becomes more attractive with the beauty of terraced fields which have yellow flowers, also of magnificent waterfalls looking like white hair linking with the milky cloud above. 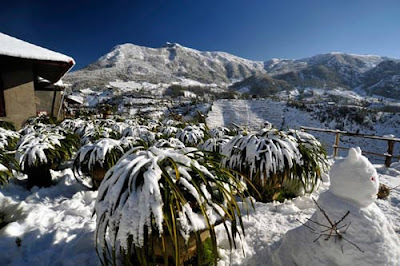 Perhaps, the most enjoyable excursion in lifetime is traveling to Sapa in winter. Although the climate is coldest in the year when the temperature sometimes, goes down to 0 0C, and it is snowy, it always brings exciting experiences to visitors. Beside the white color of snow covering everywhere in Sapa, roads and fields in Sapa are dotted by colorful traditional clothes of ethnic groups in Sapa. Furthermore, in the cold weather, nothing is compared to enjoy hot and drilled dishes in Sapa, which make your trip become one of the most amazing ones in your life. Seeing is believing, Let see our Sapa Tours to check, right now!